Photo by ‘unknown’ if you took this photo please go to the copyright page. Another shot of a Leigh Corporation AEC Regent III there was one on stand last April the shot was in colour too you can see it here. This Regent is four years older and was built by a different body builder Roberts of Wakefield in Yorkshire. In 1948 the overall length was 26ft it wasn’t until 1950 the length changed to 27ft although I can’t see one foot making all that much difference, touch more legroom perhaps. The shot of a No.26 Manchester – Leigh (1965) brings back memories, I used to see this in Swinton (top of Worsley Road/Chorley Road junction) in the late 50s/early 60s. Happy memories of travelling to Golborne (trainspotting) on summer Saturday mornings. Via Worsley (under the wires), then across the East Lancs Road again via Boothstown. Change at Leigh for the 46 or 47 for Warrington, (Have I remembered correctly, can anyone confirm? ), we arrived at the roundabout on the East Lancs. Road from the North (does anybody know the route it took please?) before jumping off at the roundabout risking life and limb to leg it up to the railway life just to miss a semi. 8 hours, several Shippam’s paste butties and a bottle of Tizer later it was time to go home, full of stolen peas from the adjoining field and very sweaty and grubby. Happy days. I pity the young of today. Yes you are right about the service numbers. Both departed Leigh via Lords Street turning right at Butts Bridge the down Warrington Road to the East lances Road. The the 46 went to Warrington via Risley and Padgate and the 47 via Croft and Winwick. But you are wrong if you think that’s Golborne. Golborne is 3 to 3.5 miles down the East Lancs Road towards Liverpool. I’ve worked on the buses for the last 40 years starting in 1975 at Leigh. Thanks for the response. So what bus did I get?? Definitely out of Leigh, definitely jumped off on the East Lancs Road about a 100 yards from the West Coast main line. Ron Ollerenshaw. Ron, I also used to trainspot in the early/mid-60’s but a bit further down, at Stones Crossing in Newton-le-Willows, where the WCML passed under the Liverpool-Manchester line. However if you spotted as you say, where the WCML passed under the A580 East Lancashire Road then that would be in Golborne. From Leigh you would have taken the 57 Wigan service via Lowton,Lane Head & Golborne Centre or the less frequent 58 via Plank Lane & Derby Road Housing Estate to Golborne Centre. These services then unusually did a double run up to the A580 roundabout to turn back to Golborne Centre, then on to Wigan or back to Leigh. That timing point was called Golborne, Park Road and was almost at the junction of the A573 with the East Lancs roundabout. Later on, in the mid 60’s the services turned in a small loop outside the Queen Anne Hotel instead of going up to the East Lancs roundabout. Although 57 & 58 were nominally LUT/Leigh Corp. jointly operated, and did so, only Leigh Corp. operated on the 58, which was a pretty sparse service, every 2 hours, with the extension to Wigan only on Saturday pm and just one through to Wigan late pm on a Sunday. The joint 57 was always hourly though. The Park Road bus stop was just yards from the East Lancs Road /WCML overbridge as you say, so this could be the location, and I feel pretty sure there would be peas in the adjoining fields though I doubt the scarecrows would have bothered you! Yes, happy sweaty, grubby days with Shippams paste butty bits floating in your bottle of Tizer or Jusoda. We used to have Seniors fish/meat paste, probably because it was made just down the road from where I lived near Wimbledon. Shippams was made at Chichester, if memory serves. Well really Chris, I was expecting a comment about Leigh Corporation bus services or Britannia Pacifics and ‘Jubs’, not a discourse on the merits or attributes of 1960’s fish pastes. It obviously caught your imagination! By the way, Sutherlands and Princes were yet another two manufacturers…. I think but I’m not over sure, but was the Renown to take over from the Bridgemaster does anybody know. This wasn’t the first time the Renown name had been used by AEC in the late 20s early 30s there was a six-wheeled chassis called the Renown. It would appear that the chassis was used for both double or single deck vehicles. Picture here of a double decker (scroll down to first b/w picture). Picture here of a single decker. The Renown was a replacement for the Bridgemaster. The big problem with the former was that it was of integral construction, which at that time was unacceptable to just about every operator of any significance. In fact by the time the Renown emerged everybody was moving to Atlanteans and Fleetlines, so that was a flop as well! Yet two more AEC dead-ends, to rank with the ‘Q’ the Regent IV and the Monocoach! I remember that when AEC announced its intention to build the Renown, the shrinking market for front-engined buses was recognised, and it was intended that the new model should replace the full-height Regent V as well as the low-height Bridgemaster. Quite why that didn’t happen I don’t know for certain, but in view of the Renown’s reputation for being over-engineered, I would imagine that production costs made it impossible to sell it at a price competitive with other full-height models. However, full-height Renowns were built in small numbers for Leicester, Nottingham and Wolverhampton corporations, the low floor being used to give greater headroom for passengers. I’ve ridden a time or two on this preserved Leigh Renown vehicle and it is in very fine order indeed. I may be wrong, but I think I heard that it was involved in an unfortunate "shunt" recently on one of the Manchester Museum open days. Quite apart from any mechanical or other difficulties I think that the lack of sales for the model can largely be summed up in three words – "One Person Operation" – it probably arrived on the market several years too late. I have just found a brilliant facsimile of a Leigh Corporation Guy Arab model bus on EFE Models of Loughborough models, website based here in Derby. From what I remember of the pre selnec days, I don’t think that the manufacturer has captured the original dark blue. Never the less its good to see that a model has at last seen the light of day. Looks like the model livery is correct. 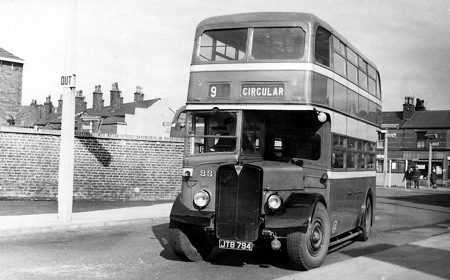 Leigh buses were light blue until a livery change in 1948. More details if you want them in the book ‘The Leyland Buses of Leigh Corporation’ Published by the Leyland Society and authored by Ron Phillips. Oh how I remember with delight, the diversity of the Leigh Corporation fleet. I moved from London to the village of Glazebury, just outside of Leigh in the mid 1960,s and travelled daily into Leigh to work. My favourite bus was the A.E.C. Renown with it’s powerful sounding engine. My favourite journey, on the Renown, was the no.26 from Leigh to Manchester, especially if I managed to acquire an upstairs seat at the front. Another memory from those days is the TIM ticket machine, of which, I have several in my collection, including a 1930’s Leigh Corporation machine. Now resident near Plymouth, I am a member of Plymouth City Transport Preservation Group. As this bus has a lowbridge body the upper deck would have a side isle and 6 rows of 4 seats and a 3 seat row at the rear with lots of ‘mind your head’ signs. It looks older than 1952 I think that may have something to do with the painted radiator. In 1969 this bus was transferred to SELNEC with a fleet no of 6941. 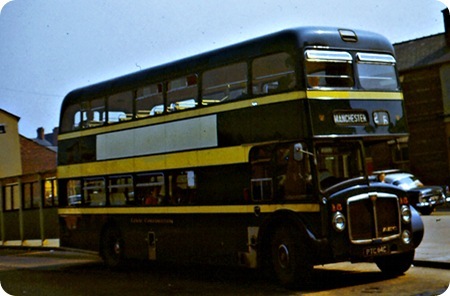 I used to go to school on these Leigh Corporation buses – no picture I have seen does justice to the immaculate paint job, nice site for memories. My thanks for the following information to anonymous, I’m not surprised when you read what he used to get up to. I also remember going to school on these lovely old buses. I have tried describing this type of bus with the long bench seats upstairs to my friends in the south of England where I now live, but nobody recognised the design. I never realised it was because the bus had a "low bridge body" you learn something every day. Finally I must recall a somewhat disgusting trick we youngsters had of wetting (licking!) our paper bus ticket and sticking it on the roof of the bus when you peeled it off at the end of your journey you left a lovely transfer print of your ticket, which remained till the bus was re-painted! That is an interesting shot in Leigh bus station,the bus is passing the number 1 bus route stand (Plank Lane) but the destination blind reads Astley which was the number two route immediately behind so the bus would be pulling away in the picture, both stands being at the rear of the Woolpack pub (Run by my Aunty Annie) and across from Kingstreet Methodist church visible in the background. I was one of those kids who used to undo every screw I sat next to by half a turn with my penknife and wind the destination blind to a new destination, as I remember the front one was changed via a drop down flap from the upstairs saloon. Seemed great fun back then. As a Leigh lad, born in 1953, I have ridden on many of the corporation’s buses and pulled many of the ‘stunts’ referred to by others. A favourite trick with the open rear entrances was to alight from the moving vehicle as it turned from King Street into the bus station. My most regular ride in the mid/late sixties was the number 6 service to Higher Folds, alighting at Green Lane to walk the last few hundred yards to school. This was a regular turn for the Renowns which gave a very comfortable ride on their ‘air suspension’. Occasionally a Dennis Loline would deputise and while the ride was a little more firm, they still surpassed the older buses. One of my lifelong friends has driven the preserved Renown on a number of occasions about 25 years ago. He said it was good, alas, it is now necessary to have a PCV licence! I spent a year at Padgate College doing my PGCE teacher training. I was a regular user of the Renowns on the Warrington – Leigh services. Further to my last post, there is another ‘Corporation’ bus which has been privately preserved. It is a Lydney bodied Leyland PD2/1., fleet number 16, registration number KTD 768. I think it is currently housed in the St. Helens Transport Museum. Also, in 2006, The Leyland Society Ltd. has published ‘The Leyland Buses Of Leigh Corporation’ in its ‘Leyland Fleet Series’. It also covers the non-Leylands. I think they still have copies available. Its great to see these pictures of Leigh buses. My father who sadly died when I was young was a conductor for Leigh in the late 60s early 70s, and I remember going to see him on the Hindley Green bus where it turned round at Thomas st / Leigh Rd. I can just remember him hanging his ticket machine up at home and being given some nearly used up rolls to play with. I started Looking for a machine some years ago as a reminder and now buy & sell and have a collection of over 120 machines and punches including 9 Leigh. Also Leigh destination blind, badge, rule book, and route/fare book. I would like to here from anyone who had connections with Leigh corporation. 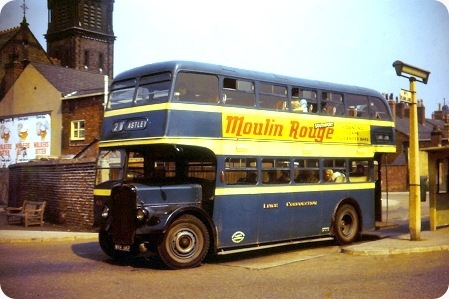 The bus shown was one of a batch of six with East Lancs Bodies new in 1952 so was 17 years old in 1969 at the time of the SELNEC North takeover. I too went to school on LCT buses but left for Manchester uni. with 10 others in 1953. Though now long gone LCT is remembered as a go ahead operator. Many post war buses only ran in Leigh for around 10 years but these AEC’s and the Lydney bodied Leylands notably fleet number 16 now preserved did far better. Re lowbridge buses and tickets ; as schoolboys on RLH’s in London a damp ceiling and a ticket that was clearly marked NOT TRANSFERABLE was too much to resist. It was surprisingly transferable, though of course , back to front.